The Nashville Predators will drop the puck on their 17th season tonight at 7 p.m. when they take on the Carolina Hurricanes at Bridgestone Arena. The Predators have high hopes for a season that will see them in the hockey spotlight when they host the National Hockey League All-Star game and all the festivities that are paired with it in January 2016. The Predators return most of the team that first year Coach Peter Laviolette guided to 104 points in the tough Central Division last season. The Predators expect to battle for this year’s division crown and are driven to go further in the playoffs than their first round exit to the eventual Stanley Cup Champion Chicago Blackhawks last April. Predators General Manager David Poile recently threw down the gauntlet stating "There are a lot of good teams in the League this year, the good news is we're one of those teams...this is our year." When you look to the heart of the Predators’ strengths you immediately think goaltending and defense. This year will be no different. In goal, Pekka Rinne (41-17-6, 2.18 GAA, last year) is two years removed from hip surgery and the related complications and should maintain his stature as one of the league’s top netkeepers. Carter Hutton (6-7-4, 2.61) provides a formidable backup and when the workhorse Rinne takes a game off. The Predator’s defense is said to be the strongest in the league by many pundits. It is led by perennial Norris Trophy (best defenseman) candidate and team Captain, Shea Weber (15 goals, 30 assists). Weber’s partner, Roman Josi (15 g, 40a) finished fifth in the Norris voting last year giving the Preds the top one-two defensive pairing in the NHL. The remainder of the top six on defense will be rounded out by Seth Jones, Mattius Ekholm, Ryan Ellis and newcomer Barret Jackman. Jackman was signed as a free agent in July and will provide character and grit, which is a much needed addition to the team. Scoring has always been a concern to the Predators but was much improved last season with the addition of rookie Phlip Forsberg (26g, 37a), Mike Ribero (15g, 47a), and James Neal (23g, 14a). Another free agent signing that has never reached his projected potential is Cody Hodgson. Drafted tenth overall in the 2008 NHL draft by Vancouver, he slumped to a career low 13 points last year in Buffalo. With a new team he is hoping to return to his 44 point production from two seasons ago. Other key offensive players will be Craig Smith (23g, 21a), Colin Wilson (20g, 22a), and Carrie Underwood’s husband, Mike Fisher (19g, 20a). Youngsters Austin Watson, Calle Jarnkrok, Victor Arvidsson, and Kevin Fiala stand poised to step up and contribute and hope to claim permanent roster spots. For fans watching from home, a couple of big changes are in store. All 82 Predators game will be televised for the first time with 78 games on Fox Sports Tennessee and the remaining four on NBC Sports Network. Additionally, “The Voice of the Predators” Pete Weber will move from the television side to the radio as he returns to broadcasting in his medium of choice. He will be assisted by Brent Peterson and former Preds goalie, Chris Mason. Willie Daunic will take over the TV duties and have Stu Grimson at his side. 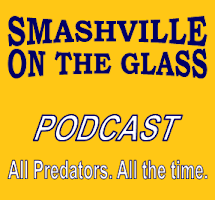 Tickets to all Predators games are available at nashvillepredators.com or by calling (615) 770-7800.